Adding new levels of performance to the A5 model line, the all-new RS 5, developed by quattro GmbH, a wholly-owned subsidiary of Audi AG, combines the classically elegant coupe and track-tested performance with the latest technologies Audi has to offer. 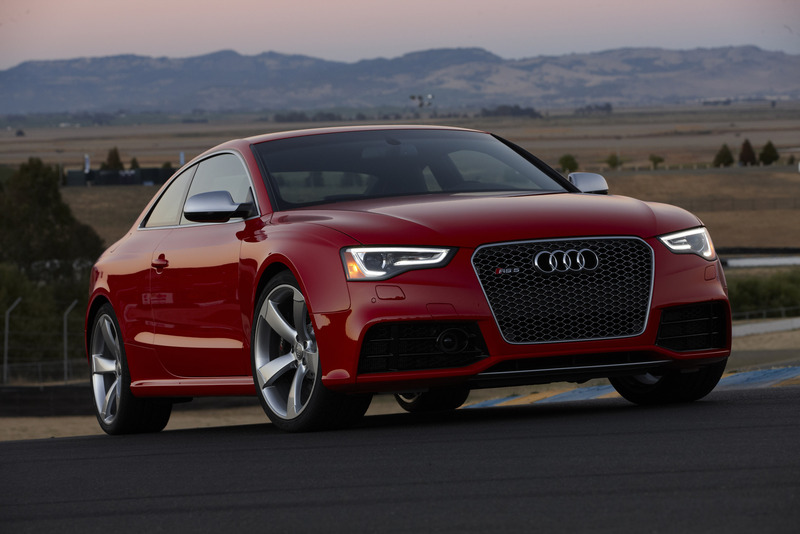 The Audi RS 5 features a high-revving 4.2-liter V8 with 450 horsepower and a seven-speed S tronic® transmission with launch control program. 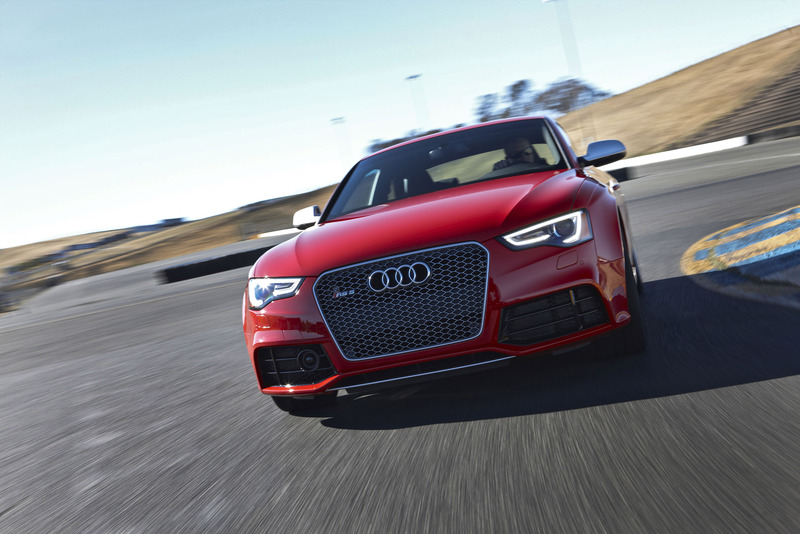 The 4.2 liter, naturally aspirated FSI® engine delivers 450 horsepower and 317 lb-ft of torque to propel the RS 5 from 0 to 60 in just 4.5 seconds and an electronically-governed top speed of 174 mph. 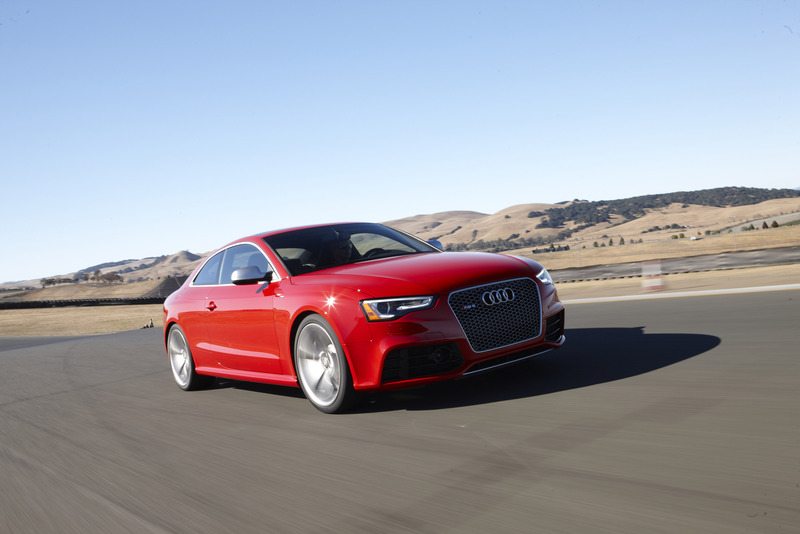 The powerful RS 5 features an optimized engine and drivetrain, on-demand oil pump, and energy-recovery system that conserve energy during coasting and braking. The standard seven-speed double clutch S tronic transmission, with its high efficiency ratio and its high-geared top speed, also enhances efficiency. Fuel economy is a respectable 16 city / 23 highway / 18 combined. The RS 5 can operate in fully automatic mode, or the driver can shift via the gear selector or shift paddles on the steering wheel. Audi drive select system adjusts the vehicle's transmission shift characteristics, throttle response, dynamic steering and sports differential. 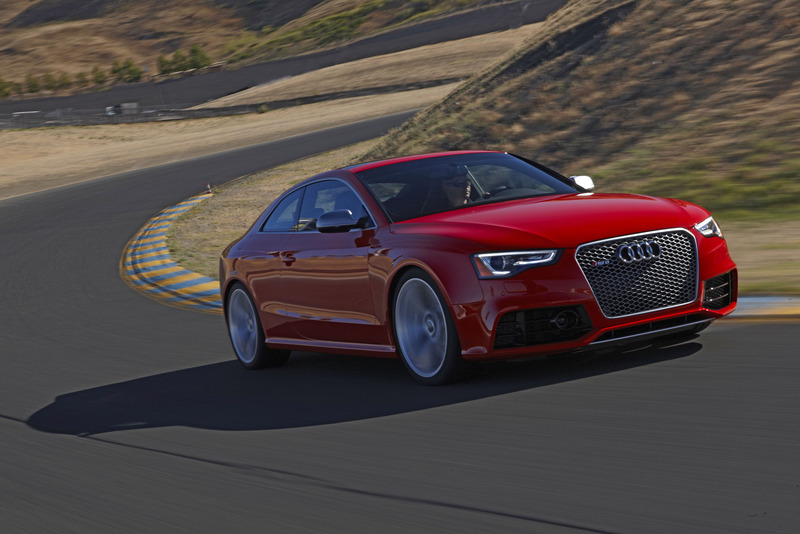 The driver can select from auto, comfort, dynamic and individual Audi drive select settings, making the RS 5 a potent drive for a weekend excursion as well as on the track. The self-locking crown-gear center differential is compact and lightweight and attains a high efficiency ratio. Thanks to its package of plates, the differential can vary the distribution of torque widely between the front and rear axles. If necessary, up to 70 percent can flow to the front or as much as 85 percent toward the tail end. The 40:60 ratio of the standard rear-biased configuration ensures sporty handling. This new differential operates in conjunction with electronic torque vectoring. 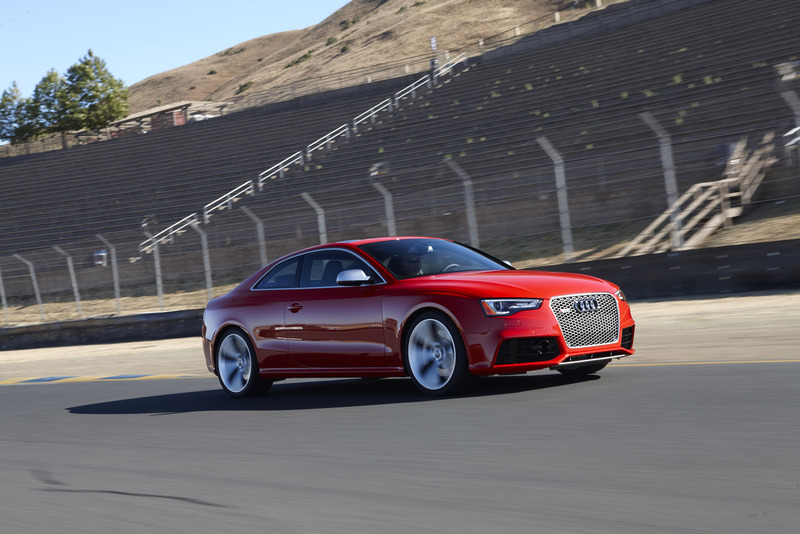 As a perfect complement to the new quattro® drivetrain, the sport differential at the rear axle is standard. 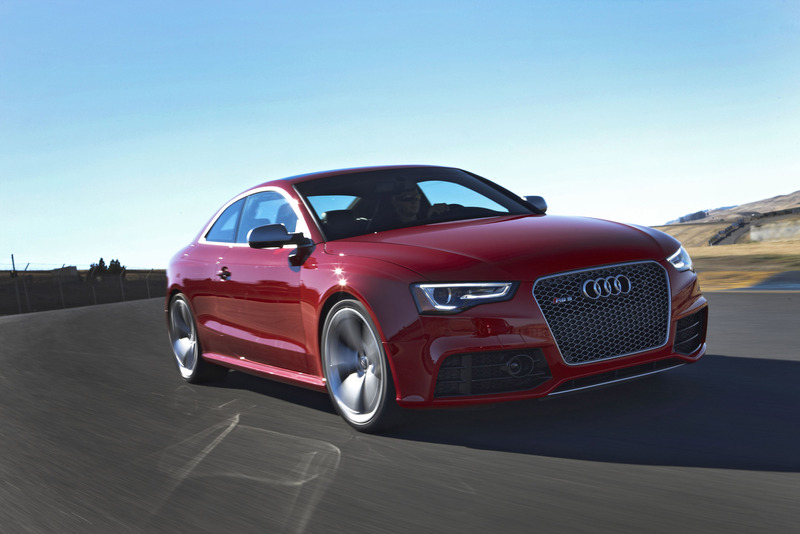 The sport-tuned suspension renders the body 0.8 inches lower than that of the Audi A5. The 19-inch alloy wheels fitted with 265/35 performance tires are standard with an exclusive ten-spoke forged design. 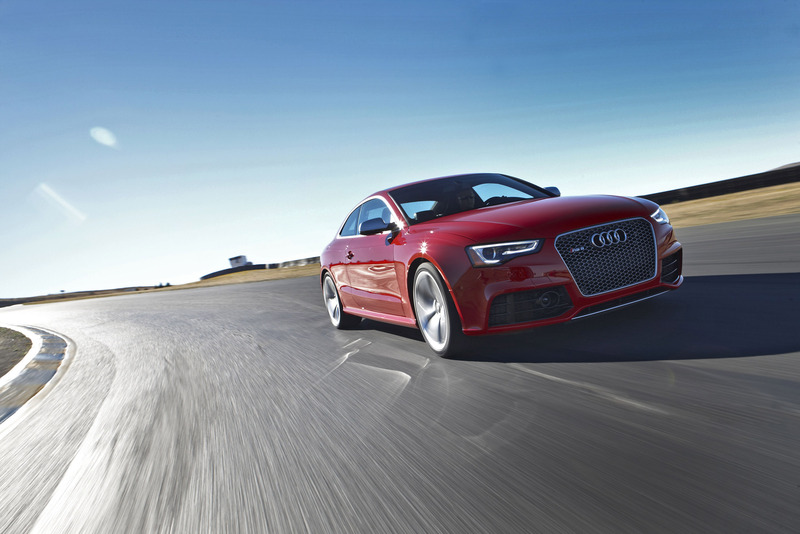 Five-spoke 20-inch wheels and 275/30 performance tires are optional on the RS 5. The brake system employs powerful and internally-ventilated discs, which measure 14.4 inches in diameter at the front axle. The high-gloss black brake calipers bearing RS logos are made of aluminum and the front calipers are fitted with eight pistons each. 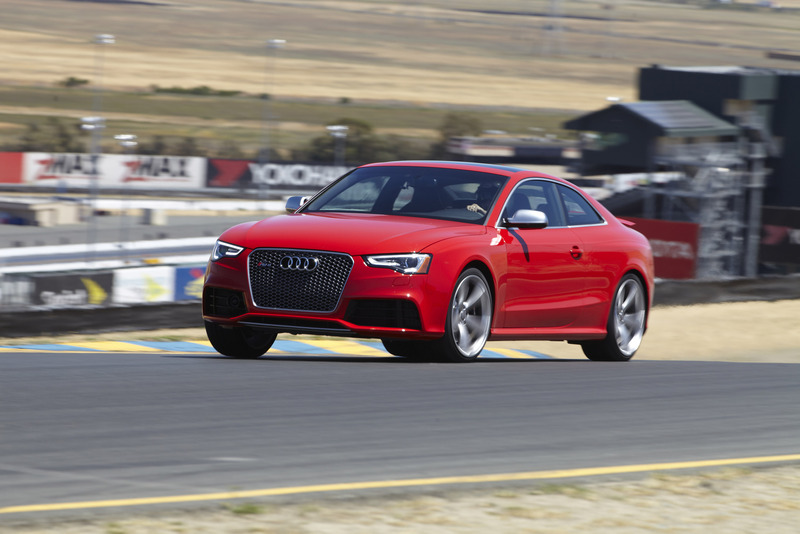 Audi can optionally fit the front axle with ceramic carbon-fiber brake discs measuring 15 inches in diameter. The electronic stability control (ESC) integrates a sport mode and can be switched off entirely. The RS 5 exudes an athletic and powerful identity; its classically beautiful coupe styling dazzles with new and clear-cut accents. Adaptive xenon plus headlights boasting a sweeping strip of LED daytime running lights are standard. The oversized air inlets for the engine, front brakes and the radiators are bordered by striking contours. The newly designed bumper tapers downward into a splitter and is available in aluminum-optic paint. The flared fenders with the crisp horizontal upper edges are reminiscent of a classic Audi, namely the all-wheel-drive pioneer Audi quattro. The side sills bear angular caps; the trim strips on the single-frame grille and near the side windows as well as the outside mirror covers feature a matte aluminum look. Eight different paint finishes are available. Two chrome oval exhaust pipes integrated within the bumper emanate a performance sound and fit the character of the RS 5. A sport-tuned exhaust with black oval exhaust finishers is available. A large diffuser protrudes prominently upward. The rear spoiler automatically is raised at a speed of 75 mph and retracts at 50 mph or can manually be raised and lowered via the push of a button. 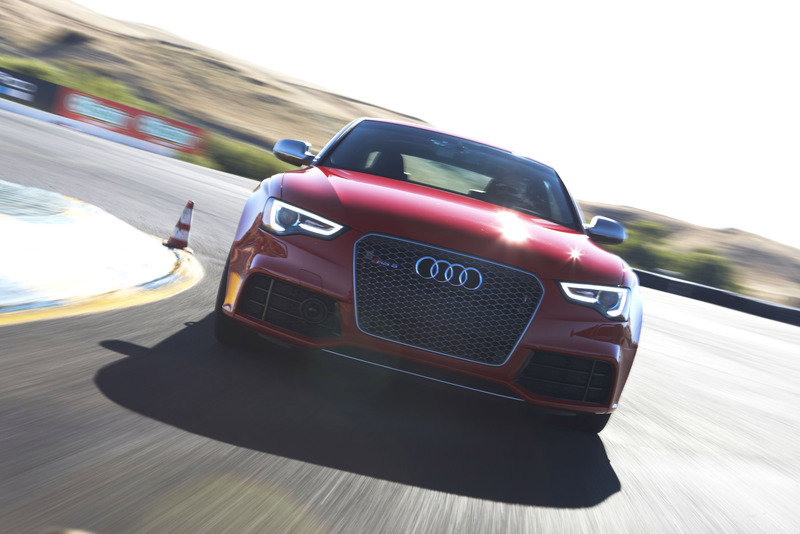 The extensively clad underbody of the RS 5 integrates air vents for the seven-speed S tronic and front brakes. 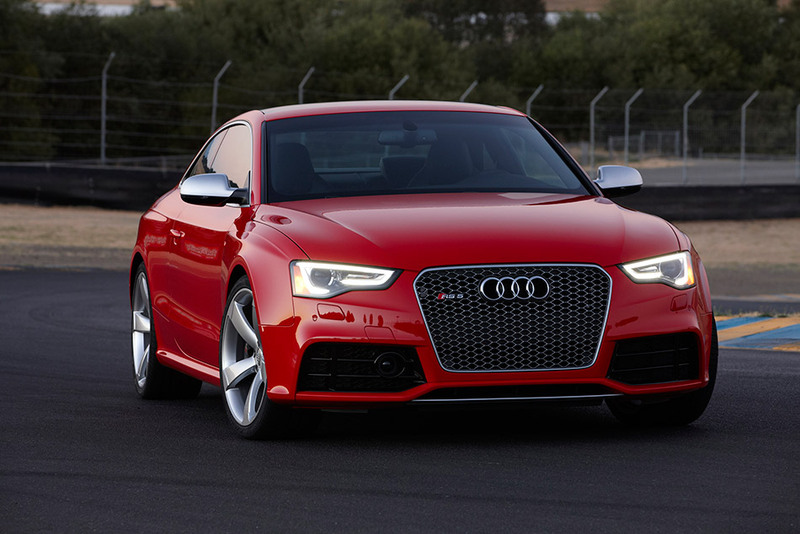 The RS 5 has been optimized to provide exceptional airflow and substantial downforce. The vehicle's dynamically elegant styling extends to the interior, where power-adjustable sport seats with pronounced side bolsters and integrated head restraints are finished in fine Nappa leather or optional leather / Alcantara®. Rock gray seat piping adds to the sporty look of the interior. An RS flat-bottom steering wheel is covered with perforated leather. The instruments have black gauges and white lettering with distinctive scaling. The driver information system integrates a lap timer for recording circuit times and an oil-temperature gauge. The interior is black, and the decorative dash inlays are made of carbon fiber. 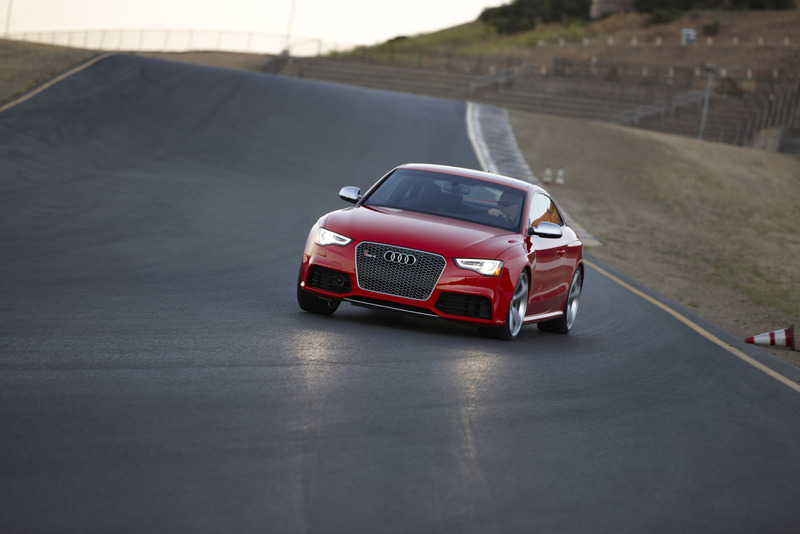 The pedals and the footrest, trimmed in aluminum, add to the performance elements of the RS 5. Aluminum inserts adorn the door sill trims, and RS 5 logos lend dynamic highlights to the interior in the instrument cluster, gear shifter, seats and on the Audi MMI® Navigation plus welcome screen. 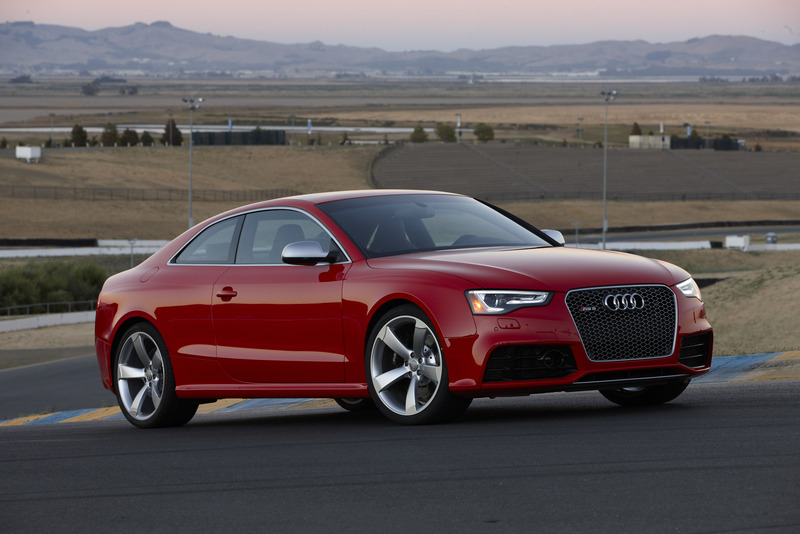 The 2013 Audi RS 5 incorporates many available features that are designed to help make the driving experience more enjoyable and to give drivers greater confidence. Audi parking system plus includes a rearview camera and an acoustic warning system that help drivers enter or exit safely from parking spots. Audi adaptive cruise control, Audi side assist and dynamic steering are optional features that offer industry-leading driver assistance capabilities. 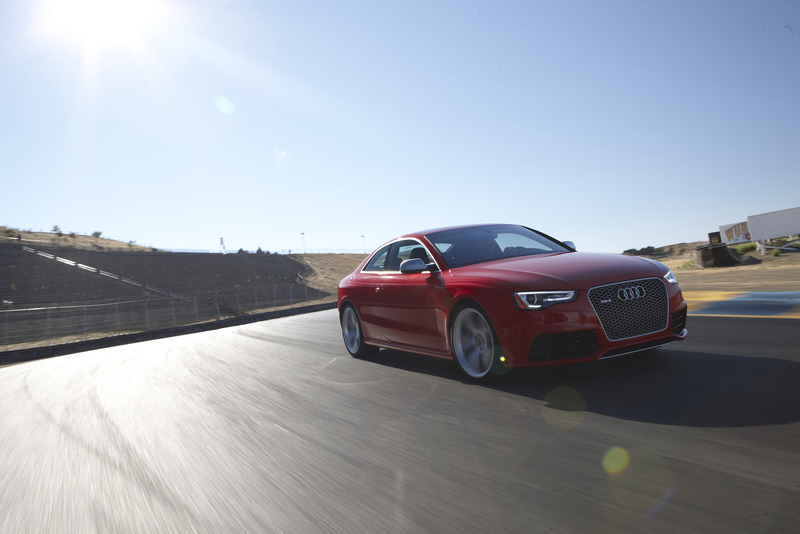 Adaptive cruise control helps regulate the distance between the driver of an RS 5 and traffic ahead of it, and it even initiates emergency braking at speeds below 19 mph while providing the driver with complete autonomy. Dynamic steering automatically adjusts steering input and effort required in relation to how fast the vehicle is traveling, thereby making steering more direct at higher speeds and effortless when parking. Side assist utilizes sensors to notify drivers of other vehicles occupying or moving into their blind spots. The system warning lights incorporated into the side view mirrors on the RS 5 flash when a vehicle is in or is about to enter the lane next to the RS 5. Audi connect enables first-to-market Google Earth™ integration, which redefines the navigation experience. The realistic, panoramic views and high-resolution 3D satellite and aerial imagery provide drivers with a better navigation experience. Audi connect with Google Earth also improves visual orientation with a "camera zoom" feature that allows closer views of surroundings or destinations. Added to the high resolution of Google Earth imagery is an overlay of street mapping data provided through Audi MMI Navigation plus and real-time traffic information available via SiriusXM™ Traffic subscription (four-year subscription now is standard). Audi connect also provides an industry-first factory vehicle integration of Wi-Fi® service. This unprecedented mobile hot spot capability for passengers allows connections for up to eight Wi-Fi devices and permits passengers to connect to the Internet to read email, surf the Web, stream music, gaming, etc. The Google™ Voice Local Search also is a first as part of Audi connect to enable more intuitive requests for points of interest as well as to provide access for up-to-date information. Other features include real-time information, such as weather, fuel prices and streaming news feeds.